No explanation required, here are some random thoughts that occurred to me during the past month. These ideas were either to long to force into 140 character limit of Twitter but not fully develop to belong on their own post. No surprised that Borders bookstore filed for bankruptcy and is closing several of its stores. I went to one of the Borders store locations that is closing, in Silicon Valley, to see if I can find any great deals. Even with the 25-50% off the cover price on books at Borders, Amazon has a better deal on most of the books I was interested in. Amazon typically sells books somewhere between 30-45% plus add the 9% you save in sales tax and free shipping. 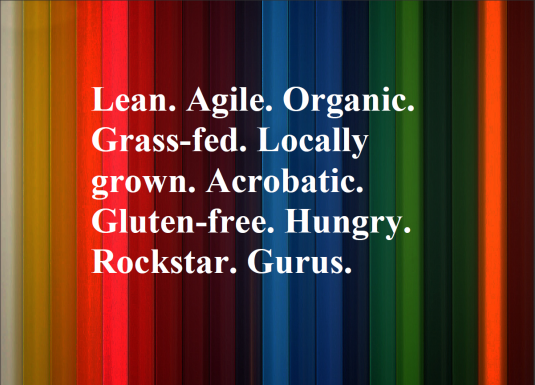 Every pitch deck should have a slide that describes the team as: Lean, agile, organic, grass-fed, locally grown, acrobatic, gluten-free, hungry, rockstar, gurus. History is made by rewriting history. Imagine writing an academic paper a 100 years from now about Lost, when several episodes have been lost, and using as resources and references blog posts and twitter streams. In some sense, this is how history books are written. History is rewritten from personal points of views, second hand accounts, supporting national myths, rewritten based on cultural outlooks, and geopolitical propaganda. If you provide a free no obligation trial version why do you need my credit card information prior to me getting access to the free no obligation trial version? I been a big fan of the online cartoon Geek and Poke and I just saw that he put out a free PDF on Scribd. I wanted to download to it the pdf ebook to my collection of free PDF document and books so that I can load it onto my other devices. Even thought I have an account with Scribd and even though I myself have posted documents on Scribd I was not able to download the Geek and Poke PDF unless a signed up to their Scribd Archive paid service, a $9/monthly service or a $5/day pass. I know that Geek and Poke is worth the $10 but I would rather have the author of the PDF get the money instead of Scribd. One reason why students and teachers fail is because teaching has been reduced to a trade, no different than a fast food industry. Do you want fries with that? What will be the codename of the next release of Android? They’ve had cupcake, donut, froyo, gingerbread, etc. What is next caramel apples, cotton candy, laffy taffy? I’ve had an iPhone for such a long time that I had forgotten how horrible an experience it is to buy or upgrade a phone from a cell phone company. I recently had to upgrade a family Android G1 to a G2 at the T-Mobile store and found the whole episode painful. First I had to wait what seemed over 30 minutes before anyone even asked if I need help. Once someone was ready to help it took all of 2 minutes to decide on the phone, but about another 30 to process my purchase. After all this I ended with a different plan that I used to have, of course I didn’t notice until I got home. I explicitly asked if my plan would be the same, I was explicitly told yes, and I came to found out that I am, not surprisingly, paying more. Why don’t cell phone companies have a self help kiosk. All I really need from their employee is for them to give me the phone. I could set the phone and the plan myself. One of my favorite podcasts is Entrepreneurial Thought Leaders put out by the Stanford Technology Ventures Program. Entrepreneurial Thought Leaders is a lecture series with guest speakers from across different fields and industries. David Heinemeier Hansson of 37Signals, Mark Pincus of Zynga, Robing Li or Baidu, Steve Ballmer of Microsoft, and a great many of other founders, entrepreneurs have spoken at Entrepreneurial Thought Leaders. So when Tina Seelig, the person that runs the Stanford Technology Ventures Program, came out with a book I knew to put it on my Amazon wishlist. Sadly no one bought me anything off my wishlist so I bought it myself to read over the winter break. A lot of the stories and lessons Tina dives into in What I Wish I Knew When I Was 20 she talks about lectures she gave back in May 2009 and in April 2006 at Standford’s Entrepreneurship Corner. In What I Wish I Knew When I Was 20, Tina gives some important lesson on creativity, opportunity, and having the right attitude to invite both creativity and opportunity in what you are doing. For example, she speaks of having her students develop failure resumes and to highlight lessons learned from making mistakes. Her reasoning behind failure resume can best be summarized by the following quote from her book. It’s a quick way to demonstrate that failure is an important part of our learning process, especially when you’re stretching your abilities, doing things the first time, or taking risks. We hire people who have experience not just because of their success but also because of their failures. Aside from taking risks, and not being afraid of failure, she speak a lot of about having the right attitude to invite the correct atmosphere for success. A persons perspective is important to success, in one because each person defines what they consider a successful venture. Like in the movie The Social Network, where the Sean Parker character says “A million dollars isn’t cool. You know what’s cool? A billion dollars is cool.” For some people success is defined by having 500 million obsessive-compulsive users, and for others it’s about having 1000 paying customers. It is often the case that people let others define their success, but the truly successful are those that define their own success. And defining success has a lot to do with a person’s values and attitudes. I took a lot of value away from What I Wish I Knew When I Was 20. For example, create a failure resume in Google Docs. I’ve also learning to try to negate the effects of negative thoughts, especially when trying or learning something new. Problems are abundant, just waiting for those willing to find inventive solutions. Steve Jurvetson, a partner at the venture firm Draper Fisher Jurvetson, describes failures as the secret sauce of Silicon Valley. Students are told that it is much better to have a flaming failure than a so-so success. Experts in risk management believe you should make decisions based upon the probability of all outcomes, including the best- and worst-case scenarios, and be willing to take big risks when you are fully prepared for all eventualities. Being too set on your path too early will likely lead you in the wrong direction. Planning a career should be like traveling in a foreign country. Even if you prepare carefully, have an itinerary and s place to stay at night, the most interesting experiences usually aren’t planned. Even when we think we’re paying full attention, there’s usually so much more to see. I realized afterward that thinking about how you want to tell the story in the future is a great way to assess your response to dilemmas in general. Craft your story now so you’ll be proud to tell it later. A few years ago I took a creative writing class in which the professor asked us to describe the same scene twice, the first time from the perspective of someone who has just fallen in love, the second from the point of view of someone who has just lost child at war. You shouldn’t take yourself too seriously nor judge others too harshly. I’ve always been a book lover. I have a private collection of Ruby, Perl, and Java books, amongst other topics, that would make a public library jealous. In fact, I recently moved and was surprised that that the bulk of the items boxed up where books. I’ve been making the trend of moving my library to ebooks. I was an early adopter of the Amazon Kindle, I still use my first generation Kindle. Here are some books in my collection, which I’ve use as reference. I’ve even dedicated a blog post to a few of my favorite books, such as the following. The hottest piece of technology this year has been the Apple iPad. The iPad is great for geeks no matter their passion, music, photography, gaming, social media, etc. A geek that travels a lot would enjoy the 3G iPad so that they can always be connected no mater where they are. Whether you give the geek in your life an iPad or if they already have one, there are a ton of great accessories such as the iPad cases. I have been happy with the standard Apple iPad Case but for something more eye catching then consider the DODOcase. 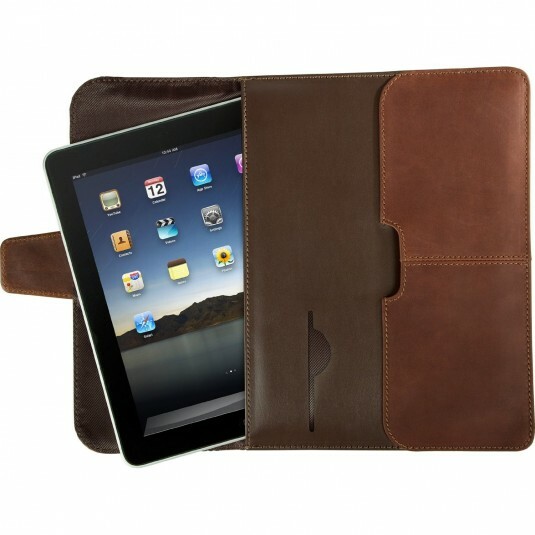 I also enjoy this leather portfolio iPad slipcase. To get the most out of an iPad you need apps, for stocking stuffers you can consider getting a few iTunes gift cards which can be used to purchase apps, music, books, and movies from the iTunes store. I’ve already written regarding my favorite iPad apps. Not every geek is into Apple products. Fortunately, there are other viable touch-based tablets such as the Google Android powered Archos 9 PC Tablet or the Samsung Galaxy Tab. For the avid reader in your life, nothing beats the Amazon Kindle. There are other electronic book readers but the Kindle is the most wished-for and most gifted ebook reader. The latest generation of the Kindle is smaller than previous versions and Amazon provides just about every top book in the Kindle format. What I love best about the Amazon Kindle is that your digital library is available to you in just about every device, iPhone, iPad, desktop, Android mobile device, and more. This holiday season the most sought after family oriented game will not be on the Wii, it will be on the XBox 360. The XBox 360 has a set of games that do no require a controller to play, instead you play them by controlling the game play with your body. 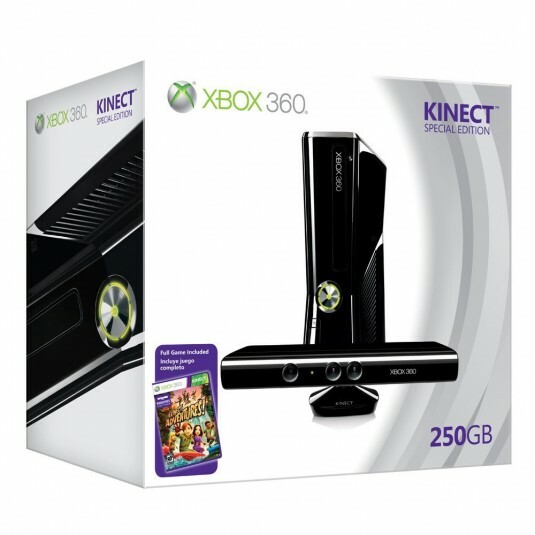 The Kinect Sensor has a series of camera’s that capture your body movements and uses that information to control the character in the game. The best game on for the Kinect Sensor has to be Dance Central. Dance Central doesn’t require any controller or pad for you to get down with your dance moves, you just dance in front of you television set.. The other games to look forward to is DJ Hero 2 and Rock Band 3.